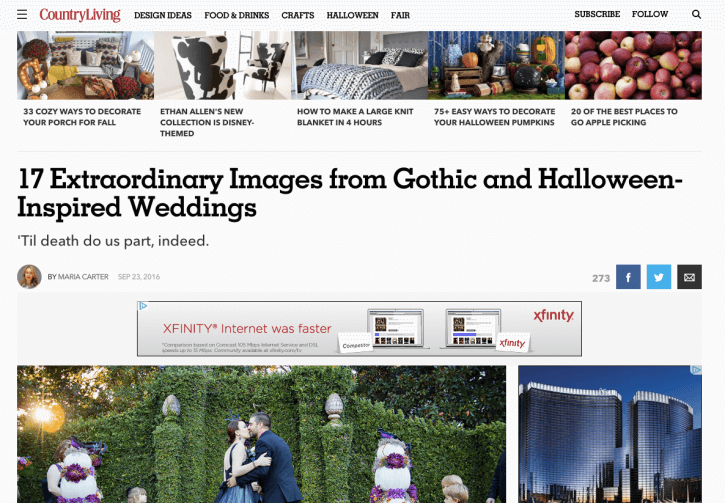 Wedding PR: Country Living, Huffington Post, and more! Wow, how is it already the middle of October? Time is flying! We are so excited to share our latest client features, including Country Living, Huffington Post and so much more! See it all below. Get Polished Events and Be Photography were featured in Country Living‘s roundup 17 Extraordinary Images from Gothic and Halloween-Inspired Weddings. See the full article here. Taylor’d Events Group was featured on AllSeated with the guest blog Handling Cancelled Events. See the full article here. 100 Candles was featured on Catersource with their guest article Trend Alert: Getting Inspired with Vessel Decor. See the full feature here. Fantasy Sound Event Services, 100 Candles, Cocoon Events Management Group, and Don Mears Photography were featured in the Huffington Post article Indoor vs. Outdoor: Candle and Lighting Options for Every Type of Wedding. See the full article here. Be Photography was featured on Jet Fete with a beach wedding in Tulum, Mexico. See the full feature here. Belladeux Event Design was featured on Special Events with the guest article Finding a Balance Between Event Design with Planning. See the full feature here. OFD Consulting was featured on Timeline Genius with the guest article Take Note: Making the Most Out of Educational Events. See the full article here. Kaysha Weiner Photographer was featured on Southern California Bride with a Rustic Vintage Crystal Cove State Park Wedding. See the full feature here. Taylor’d Events Group was featured on WeddingIQ with the guest article Training Your Staff to Make the Sale. See the full article here. Turner Photography was featured on Knotsvilla with a Mint Gold Beach Wedding. See the full feature here.